I thought a nice breakfast worthy of company would be apropos at this time of year when guests come to stay. 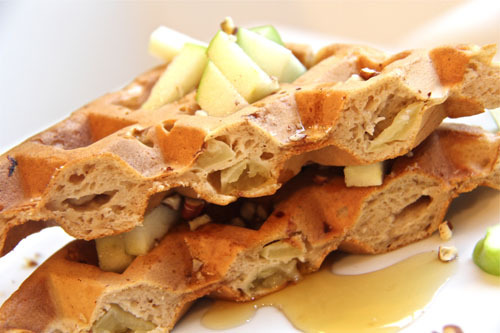 These cinnamon spiced, apple diced waffles are perfection. Their flavor is full of fall and coziness and their nice texture is tender inside but crisp outside (if you play by the rules and whip the egg whites). Ok, I haven’t been single for 20 years so this post isn’t what it seems from the title. Sorry if you were expecting some lament on how I don’t like to share my bed. Infact, I like to share my bed just fine with my hubby and sometimes my Golden Retriever curled up at my feet. And before I confess to my mega impoliteness and social ineptitude, let me tell you that I am a people person through and through; an extrovert to the nth degree, and I treasure my family and friends immensely. But, I am NOT an overnight guest kind of gal. Thankfully, my aversion to over night guests does NOT include children. I love having my nieces and nephews to stay over, and my kids’ friends now and then so at least you can breath a sigh of relief that I am not a total recluse or heartless fiend. When people hint that they might like to stay with us while they are in town, I explain that we just don’t have a guest room, which is true, but actually I ripped that sucker right out of there with my first remodel thirteen years ago. We HAD a guestroom and instead we now have a wonderfully large great room where I love to entertain friends and family. We do have a couple of sofas but unfortunately, honestly, they aren’t up for the offering. You see, I like my privacy, and typically go to bed while most of you are just finishing dinner, and I get up at the crack of dawn. I begin to feel utterly claustrophobic at 6:00 am if I am banned by “overnight guest” etiquette from my main rooms downstairs where I can normally be free to make noise, bake and not worry about disturbing my guests. I am just too antsy a person to lie in bed, listening to my husband snore peacefully, and wait for everyone to awake. Not to mention Sadie, my goofy Golden Retriever, has been known to wake-up guests by licking them on the lips while they slumber. I think that is a big faux “paw”. Get it. I am nothing if not generous with my puns. This is not a very warm and fuzzy approach to life, I am aware. I’d love to have you over for parties, dinner, drinks, and any kind of entertainment you can imagine, but I really like at the end of the night for you to go home. OK? I believe I have offered to put up Aimee from Clever Muffin a few times but since she lives across the globe and we don’t actually know each other beyond blogging, I wasn’t too worried. Sorry Aimee. Anyhow, now that we have that out of the way and have cleared the air a bit, I do want you to make these hearty cinnamon spiced, apple studded waffles for your guests over the long weekend. Because you, my friend are a giver and really don’t have the odd social phobia of over night guests that I do. Good for you! —Although aren’t you a little bit jealous that I am not pulling out air matresses and extra sheets and pillows and will have no extra laundry to do next weekend? To make the waffles: In a large mixing bowl, whisk together dry ingredients, flour through brown sugar. Turn on the waffle iron to get nice and hot. Separate your eggs and place the egg whites in the bowl of a stand mixer fitted with a balloon whip attachment (the wire whisk attachment). Whip your eggs until stiff peaks form. In a large liquid measuring cup (like a 16 oz+ one) or a medium-sized bowl, pour in the milks, egg yolks and Canola oil. Beat together with a wire whisk. Pour the liquid ingredients into the dry ingredients and stir together until barely combined. 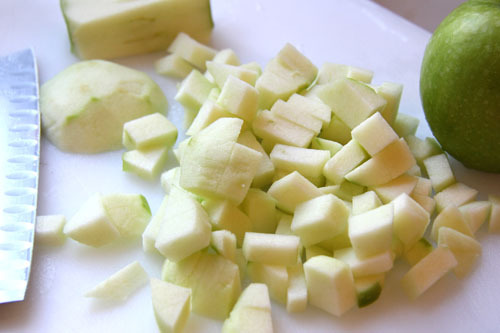 Add your apples and stir with a rubber spatula. Finally, fold in your egg whites, gently so as not to force the air out of the whites. Into a very hot and adequately ready waffle iron, scoop using 1/3 – 1/2 c. of batter into each waffle space on the iron or if you have a large waffle iron, I will let you be the judge as to how much batter to ladle in. Most waffle irons DO NOT require greasing. Never spray your waffle iron with nonstick spray. They usually become gummy if you do this. When your waffle iron shows they are ready, take them out. While the waffles are cooking, chop your pecans and toast in a small saute pan over a medium heat for 1-2 minutes, stirring constantly, never walking away. They burn easily. Chop some more fresh apples for garnishing and serve with warmed natural Maple Syrup. 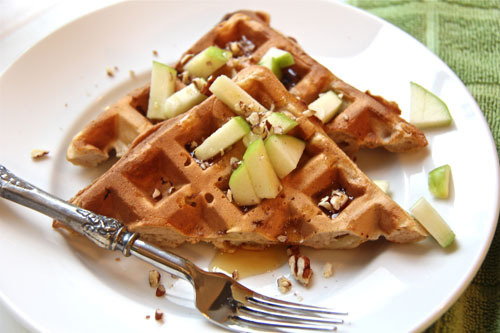 Categories: Breakfast | Tags: apple cinnamon waffles, apple waffles, brunch ideas | Permalink. You and Aimee in the same kitchen. Can Katherine and I come too? We will eat whatever you two whip up! OK, back to breakfast. Katherine and I still joke about a friend who used his biscuit making skills to pick up the ladies, which is sort of funny since good biscuits aren’t exactly in short supply down here. Maybe it was because he was a guy. You know women love men who can cook. Oh wait. Hmm. Waffles! Love them! Tell you what – if you can all save your pennies enough to come to Australia I promise to put you all up! These waffles sound great for a fall breakfast. They look incredibly crisp. I have never once played by the rules though. I am going to whip my egg whites next time and hopefully they will be extra crisp like these! Anyways, I adore having guests in the house first thing in the morning! I like waking up to chat with them as I make breakfast or bake and yes, I’m a crazy early morning girl too. I guess they are just used to me! Having overnight guests is always my excuse to make huge typically sweet breakfasts for them. I just wish I had some this week! I’d happily pull out the air mattress and do a zillion loads of laundry. I’m just weird like that! At least we have a bunch of people coming over Thursday night. I’ll enjoy waking up to a quiet house the following day! I should probably clarify that I’m really not a fancy hostess though. I rarely have anyone but my own siblings crashing on my couches. There are 8 of us and I just love the chance to catch up when given the chance. So, I don’t stress whether things are perfect or if I’m being too loud in the kitchen at all. My kids are free to wake them up by about 7am and there are typically wrestling matches in the early morning hours. Enjoy your peaceful family Thanksgiving! Gorgeous waffles and photos! I love making waffles. 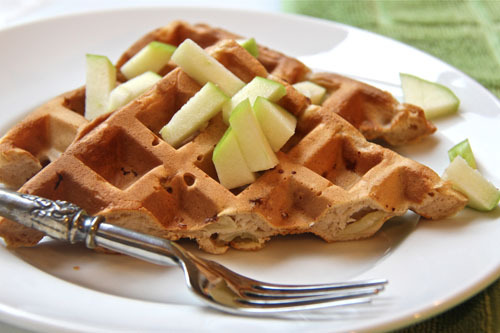 I made whole wheat pumpkin waffles not long ago…but these apple cinnamon ones sound so much lighter and delicious! Thanks for sharing, Geni! LOL! I can totally relate to this! I much prefer privacy. I don’t mind travelling with others, or having people come over for dinner, etc. but sleepovers…not my thing. Our kids are up way too early and I don’t want to be responsible for them waking up guests at 5:30 a.m. And I certainly don’t want to have to keep them quiet until a reasonable hour. It’s not worth the battle. Now I would gladly have people over to breakfast to serve these gems though! Delicious looking! I love the fresh apple over the tops. Yum! Cute post. I don’t mind having friends family stay with us, that is if they don’t mind my kids running around the house at all sorts of hours. I don’t mind if they come over for dinner or breakfast, but I’m like you I enjoy my privacy. I wish I would have seen your post earlier today. I made 3 batches of waffles, pumpkin chocolate chip, pumpkin cranberry and blueberrywaffles so I have some premade for the next month or so. Looks like I’m going to try your recipe soon! Mmmm, good. The waffles look delicious! I completely understand! There are some guests I LOVE having over and others that need to stay in a hotel. I’m a night owl and go to bed about when you’re getting up! Hey!! Can I come too? You, c, Katherine, Greg, myself… and we’ll cook you breakfast:) Lol! I love making waffles and this is a new flavor for us to try! Sure, we’ll have a party. Parties I am very good at! Those waffles look perfect! can I have breakfast at your home. Um, yeah. Same. i have a whole night and morning routine that I do NOT like to be disrupted. It’s my happy “me” time. Don’t mess with it. However, people can certainly come over for breakfast! these waffles look absolutely delicious! Though…I might want to keep the batch of them to myself also lol! A great recipe! It actually has me considering getting a waffle iron — but not accepting any overnight guests. No waffle iron John? I dont know what I would do. Yes, I think that should be on your Christmas list. Geni, dearest, I applaud your approach! I am at the opposite end of the time-spectrum, preferring a late-night-and-even-later-morning life, but it winds up meaning similar potential complications in terms of houseguests. We do have a guest room and bath, and use them a lot, both for family/friend and collegial purposes. But guests here pretty much get boot camp treatment if staying for longer than a night or two (with close connexions, it’s *instant*): I give them the full tour of the reasonably well stocked bedroom, toiletries and linens cupboards, and the full kitchen, and show them how to use the TV remote and where to find the morning paper, and after that they’re on their own from when they get up until whenever I wander out of my cave. So far no one’s run away screaming! Of course, if I fed them those waffles of yours, whatever the hour, they’d recover from the shock quickly enough! I’d never guess that you’d not like overnight guests!! Your always so welcoming and warm – not that that means you have to have people sleeping in your home! It’s so fun to learn about all our little secrets!! I do love guests, morning, noon, night and overnight! Now I am single, so I’m not saying THAT, but I love to wake up and have coffee and breakfast ready. In fact, I seriously thought of having a bed and breakfast….now that would truly drive you crazy!! I’d serve these waffles thats for sure! Love the crispy texture! They looks so crunchy on the outside – my best! Fab recipe too. I have been searching for a waffle iron that has a square or oblong shape – all the machines now days have a heart /flower shape. Breakfast by Geni ;-)) I love those waffles. Those waffles look awesome, if you did serve them to guests, I can see they’d never want to leave! That’s a funny social phobia but I’m good with it. I would definitely be happy to come to breakfast at your house. It does get a bit stressful having guests stay the night, but I do always love cooking/baking for them. Mainly baking though because I get to enjoy the preparing part, and then don’t have to eat it all/get fat because the guests will eat it. It’s a pretty great tactic. These waffles are gorgeous though, and I’m sad I didn’t eat these for breakfast this morning. My Greek yogurt is looking extremely inadequate! Getting nosed/licked by Sadie is by far the best way to be woken up. Hi Geni! This is my first time visiting your blog – it is sometimes hard to be honest but it’s great that you are very honest up front. 🙂 I get REALLY stressed out when someone is staying over while my husband is like “just stay over!” kind of guy… I guess after marrying for 6 years we’re about in between in terms of deciding over night guest arrangement. Your cinnamon apple waffle looks delicious! Oh Geni, you crack me up!!! The funniest thing is that me and my other half just a few months ago sold our spare bed and turned the spare room into a full time study. We live on the other side of Australia from all our family (a strategic move!) and a lot of our oldest friends. After realising we had guests at least one weekend out of every 3 we called it quits. No more! It was exhausting and not fun anymore. And another upshot is we also never stay at people’s houses much, after having so many guests we prefer stay on our own where can have a proper holiday. So I totally dig this attitude. Toooo funny. But don’t think you’re getting out of dinner that easily! One day I’ll save my pennies to make a whole airfare and I’m coming over for yummy food and to give your dog lots of pats (he can keep his kisses and puns to himself)! hehe. Great recipe using 2 types of flours. Love those waffles and those apple chunks all over! So yummy! Thanks for sharing! Hehe love your explanation of why you don’t like overnight guests. Entertaining, and lets us learn more about you! These are great looking waffles! These look delicious, and I’d be happy to serve them just to my own family. We don’t have a lot of space for guests, but my mom stays with us whenever she’s in town, and that works out just fine. Happy Thanksgiving to you and your lovely family! What gorgeous homemade waffles! Must smell so good with the cinnamon, and apples on top are such a nice touch!